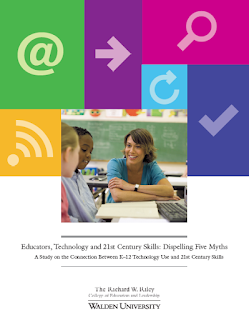 Educators, Technology and 21st Century Skills: Dispelling Five Myths, a new study commissioned by The Richard W. Riley College of Education and Leadership, explores some of the common assumptions about recent teachers' college graduates, their greater technology-literate backgrounds, and how this translates into classroom teaching and activities. The study found that despite being younger and more having a higher degree of computer literacy, these recent teaching school graduates are no more likely to use technology in the classroom than their more experienced, and perhaps less "digitally" literate, colleagues. This, in fact, is one of the five myths the study outlines - growing up technology-literate does not necessarily translate into being comfortable using technology as a teaching and learning tool. Teachers feel well prepared by their initial teacher preparation programs to effectively incorporate technology into classroom instruction and to foster 21st century skills. The study is based on a survey of more than 1,000 U.S. K–12 teachers, principals and assistant principals, and well worth the read. How I wish we had reports like this about the Canadian experience.